(August 15, 2011) Most farmers grumble about paying freight costs to the railways. Little wonder when that can amount to 30% or more of the value of their grain. What really makes some farmers mad is when they see they are charged freight on their malt barley when it is only going a little way down the road. All commodities are given a market price based on delivery to a certain point. Usually these places have some historical or technical significance. The Alberta oil man who hears that the world price for “West Texas Light Sweet Crude” is $85 a barrel knows that he will not get the world price. He will pocket the world price minus what it would cost to move that oil from his well in Alberta to the refineries in West Texas, even if his oil only goes down the road to Edmonton. This cost or “basis” includes transportation and the other costs of moving a commodity from production to the international price location. This is the way all global commodity markets have worked since they were invented. 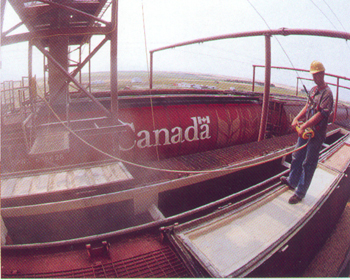 Grain is priced based on delivery to export ports. In Canada the principle export ports are Vancouver, Prince Rupert, Thunder Bay, and Churchill. Many open market proponents claim the “trade” makes their money through the basis. That’s an interesting concept. When the basis is positive does that mean the “trade” is losing money on every tonne they buy? Hard to believe that’s true. Canola is used for different things: biofuel, meal, and canola oil to name a few. There are also domestic and foreign buyers. Does anyone believe that these different users all purchase canola at the same price? Absolutely not! However the producer only gets one price and the “trade” pockets the difference every time. The producer does not even have an idea of the sale price of the canola he produced. Roughly 80% of the grain traded on the planet is handled by four big private corporations. They keep things secret, like their costs and risks for moving grain to port. However the Canadian Wheat Board makes sure that farmers know all their costs. So the next time someone asks why they pay freight, just tell them that is how the market place works. Those who claim the trade is transparent and they do not pay freight on non-Board grains do not have the whole story. For additional information, read Canola Magic.